September is National Biscuit Month—and Sausage Gravy and Biscuits appeared on the menu in the Mama’s Corner of the World kitchen last weekend. As I’ve said in the past, many of my recipes and kitchen skills were passed down from my grandmother. I can count the number of times that I’ve made gravy during the past 10 years on one hand—maybe 5 —but, it is still a skill that I have and comes in handy every so often. While my grandmother made gravy out of any meat drippings that she had—everything from the obvious chicken and beef to the not so common bologna and hamburger, I tend to stick to sausage gravy during the occasional breakfast—and sometimes chicken or turkey if the mood strikes. The key to quality gravy is fatty, unhealthy meat drippings. (GASP! Yes—sausage gravy and biscuits should be enjoyed only if the day's activities include a brisk hike or outdoor adventure!) Those drippings are the ones loaded with flavor, of course! However, in an effort to make the bad for you gravy at least a little better, I use leaner meat and supplement with a little Canola Oil to achieve 2-3 Tablespoons of pan drippings. Brown the Sausage. Brown the sausage in a large skillet with tall sides that will accommodate the size of the gravy and the stirring. Remove the sausage with a slotted spoon, allowing most of the drippings to remain in the skillet. Prepare the Gravy from the Sausage Drippings. Add the flour and ¼ tsp. Black Pepper and 1/8 tsp. Salt to the pan drippings and stir to incorporate. Heat over low heat until the flour mixture is lightly browned. Whisk in ½ cup of milk and continue to whisk until the mixture is free of flour lumps. You may need to press the lumps out with the back of a spoon if they are stubborn! Continue adding the milk in ½ cup increments and stir after each addition until the mixture is smooth and begins to thicken. You may wish to add more or less milk to create thicker or thinner gravy. We like ours thick, so I never go over 2 cups of milk. If you discover that you have maxed out the flour’s thickening ability, rather than adding more flour—dissolve a tsp of cornstarch into a 1/3 cup of milk and add the cornstarch mixture to the gravy. Heat to boiling and the cornstarch will thicken without adding a doughlike flour taste to your gravy. Return the sausage to the gravy. Add the sausage to the pan of gravy and heat through, coating all of the crumbled sausage with gravy. Plate and Serve. Split apart a biscuit and place open-faced onto a serving plate. Tops with sausage gravy and offer additional salt and pepper if desired. 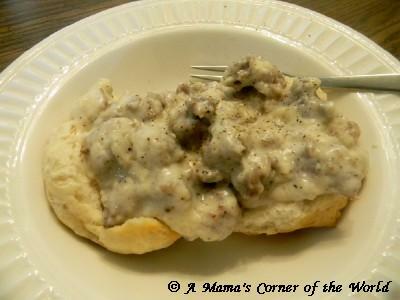 Even if you've missed National Biscuit month or National Biscuit and Gravy week like we almost did--that's okay--go ahead and try the Sausage Gravy and Biscuits recipe anyway!